While most North Americans spend December 7th shopping for gifts at the local mall, in Guatemala people celebrate el dia del diablo or Day of the Devil. 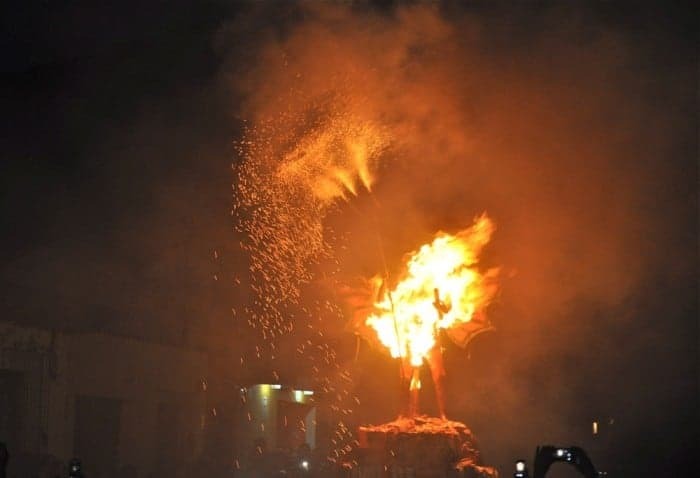 During this special Guatemala celebration, people douse enormous effigies with gasoline and light them on fire in the streets in a ceremony called la quema del diablo (burning of the devil). 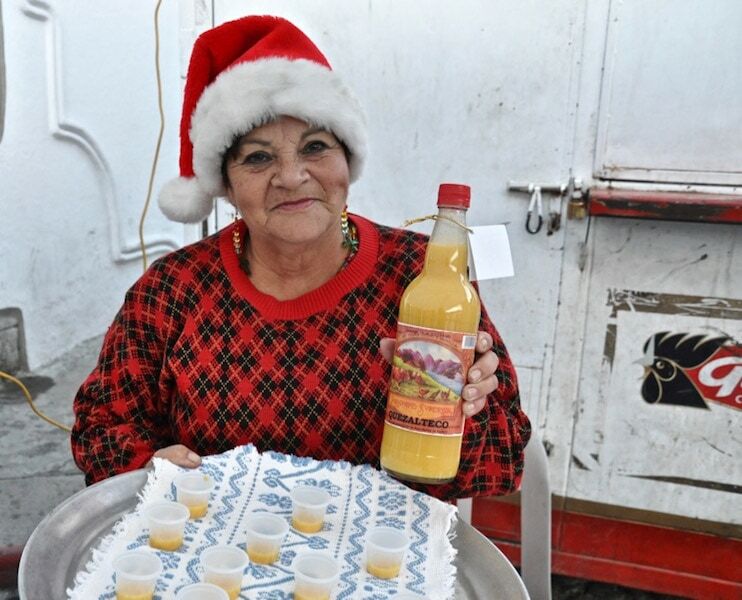 They also enjoy special food and festivities that kick off the beginning of the Christmas season in Guatemala. 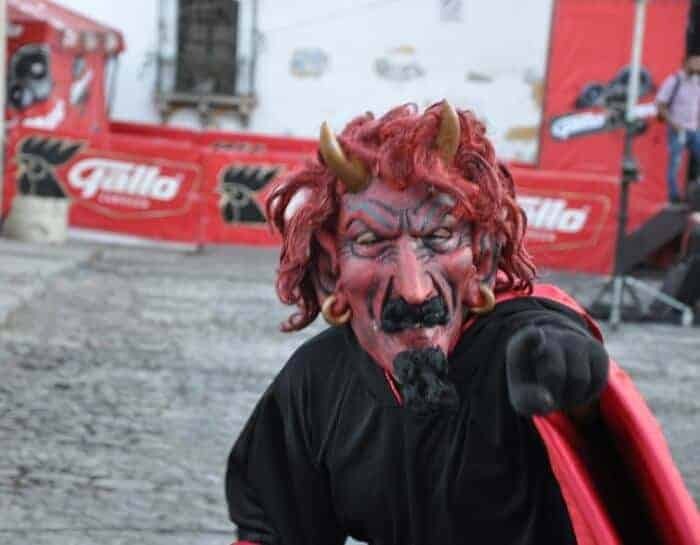 El dia del diablo is a Guatemalan custom deeply rooted in spiritual and pre-Hispanic beliefs and is well worth travelling to Antigua, Guatemala to experience first-hand. The history of el dia del diablo dates back to ancient times. 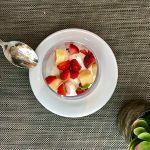 The power of fire has long been recognized by early cultures who revered the element of fire for its ability to provide warmth, to provide sustenance through cooking as well as its ability to destroy. Fire rituals can be seen in virtually every culture and religion around the world — from Buddhist Fire ceremonies to First Nations smoke smudging traditions–with the primary function of fire being one of purification, cleansing and transformation into the divine. It’s believed that the Guatemalan tradition of la quema del diablo or burning of the devil symbolizes the ritual cleansing and banishment of bad spirits to usher in the Christmas season. It’s a process of purification leading up to a holy season filled with important religious dates and other Guatemala traditions for Navidad that include the December 8th Feast Day honoring the Conception of the Virgin Mary, the nightly posadas (processions) that begin nine days before Christmas, Christmas eve, the Day of Kings and more. To fully understand the tradition of el dia del diablo it’s worth going to the source. Accompanied by Adolfo Cruz, a cultural expert and interpreter from Culture Xplorers, I began my journey in Concepción, a picturesque Maya village set in a fertile valley 20 minutes from Sololá, near Lake Atitlan. 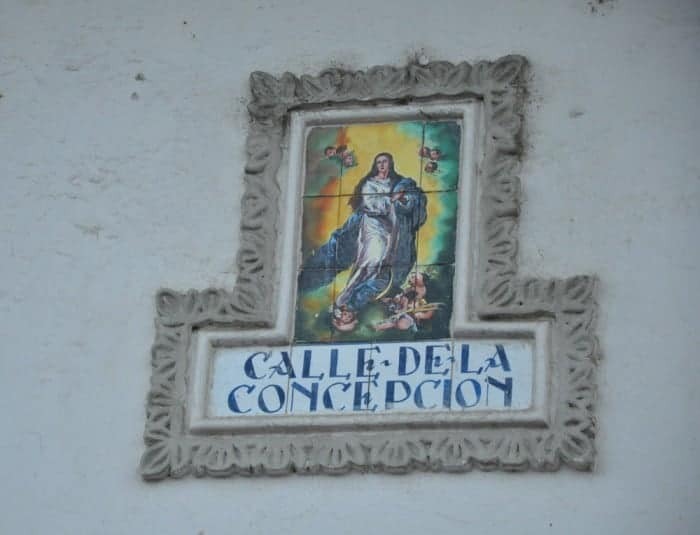 The heart of Concepción is a sturdy Catholic church constructed in 1621 and one of Guatemala’s few churches to have survived centuries of earthquakes. It features a still-intact wooden roof carved with angels, saints and apostles. It’s also home to an active cofradía, a Maya brotherhood who are guardians of ancient religious practices. Many still wear their traditional embroidered clothing featuring a distinctive bat–a symbol for the last Kaqchikel dynasty–atop rainbow-hued trousers, a tunic wrap and sandals. I arrived in time to witness them preparing for the December 8th Feast Day honoring the Conception of the Virgin Mary. 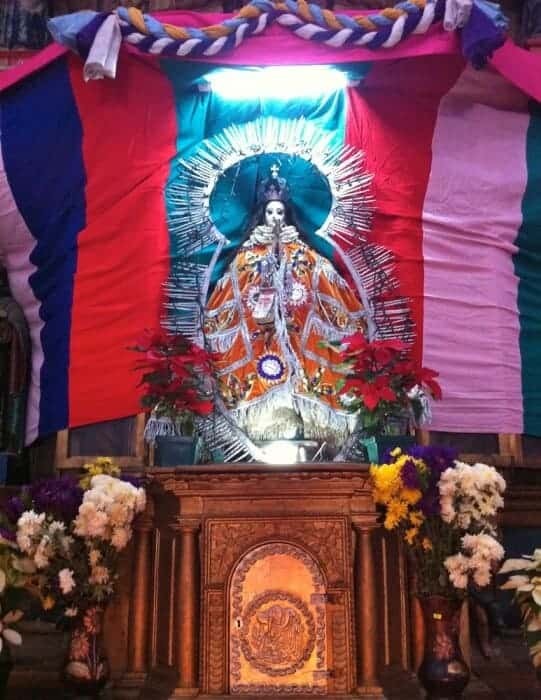 They had laid wooden platforms through the center aisle of the church to serve as pagan altars for offerings of food, candles and other tribute and were busy installing a ceremonial silver candelabra but stopped to explain how they would lead a statue of the Virgin in procession through the village. The Virgin herself was rather diminutive and festooned with money, lottery tickets and other adornment for her saint day. 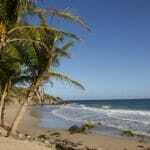 The locals also celebrate with fireworks, music and special dishes such as pulique, a chicken stew. Tip: Learn how to prepare authentic Maya pulique in my post on Cooking Class in Guatemala: Ceremonial Chicken. It was then time to head to La Antigua, Guatemala’s atmospheric former capital. 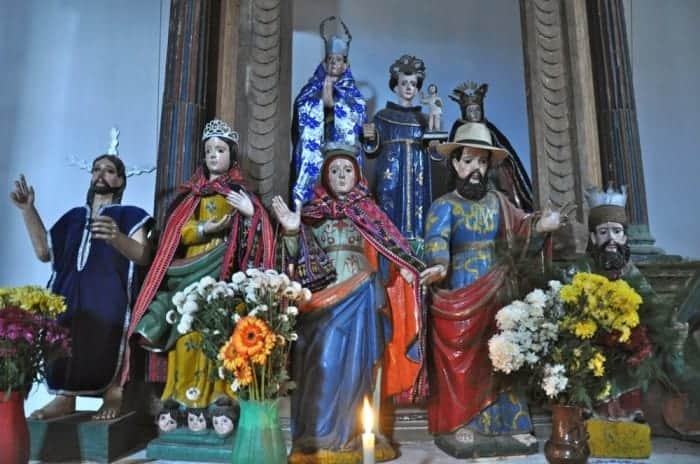 In addition to being the heart of organized festivities for la Quema del Diablo in Guatemala, Antigua is also a great base for experiencing Semana Santa ( Easter Holy Week) and Day of the Dead, other unique Guatemala celebrations. Some of the other top things to do in Antigua include studying Spanish at one of the many Spanish language schools, climbing a volcano and visiting the coffee plantation dotted on the lush volcanic slopes nearby. 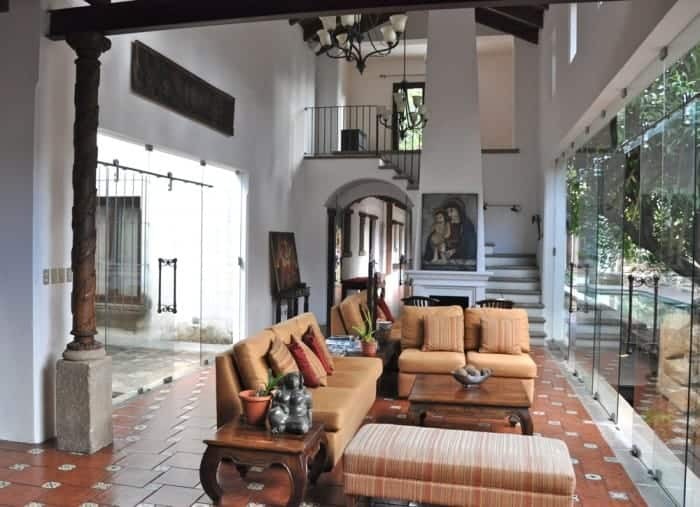 My base was Hotel Cirilo, an art-filled boutique hotel in the quiet Candelaria neighborhood. 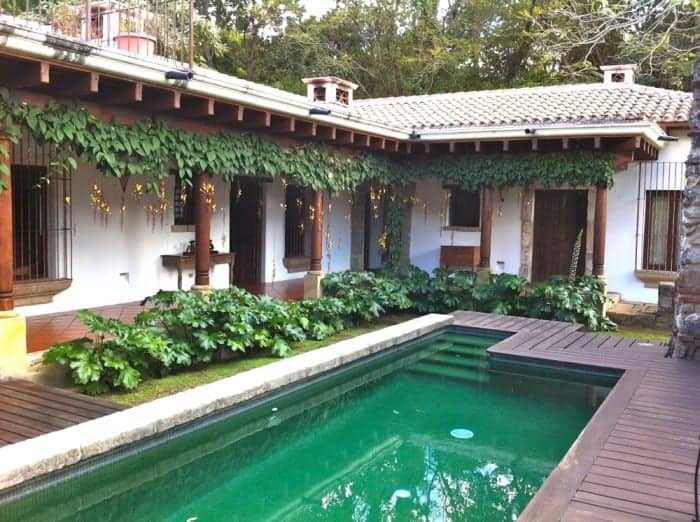 Although not quite as luxe ( or as pricey) as Hotel Panza Verde (read my hotel reviews in 3 Budget Hotels You’ll Love in Antigua), Hotel Cirilo offers an elegant and quiet stay away from the festivities. The sense of tranquility is accentuated by its setting within the bougainvillea-draped ruins of a 17th century chapel. 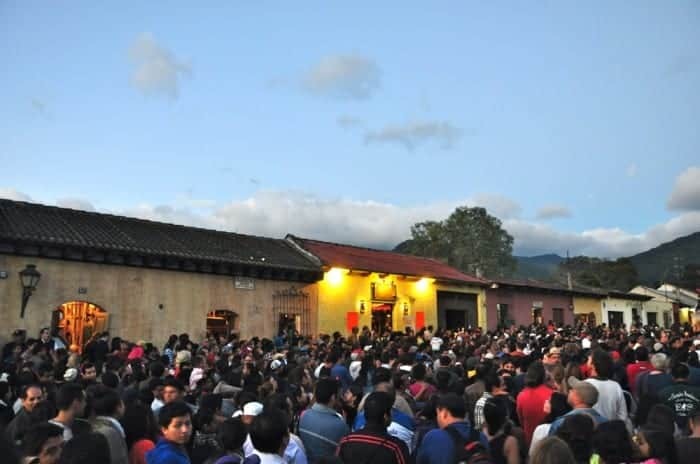 As the sun began to set, people began making their way to Barrio de Concepcion, the centre of Quema del Diablo or Burning of the Devil festivities. You know you’re in the right neighbourhood when you see this sign or you can just follow the crowds. It’s the opposite side of town from La Merced church. Although other Guatemalan communities celebrate by burning tires in the streets, in the Concepcion neighborhood of Antigua, authorities are trying to keep festivities under control. 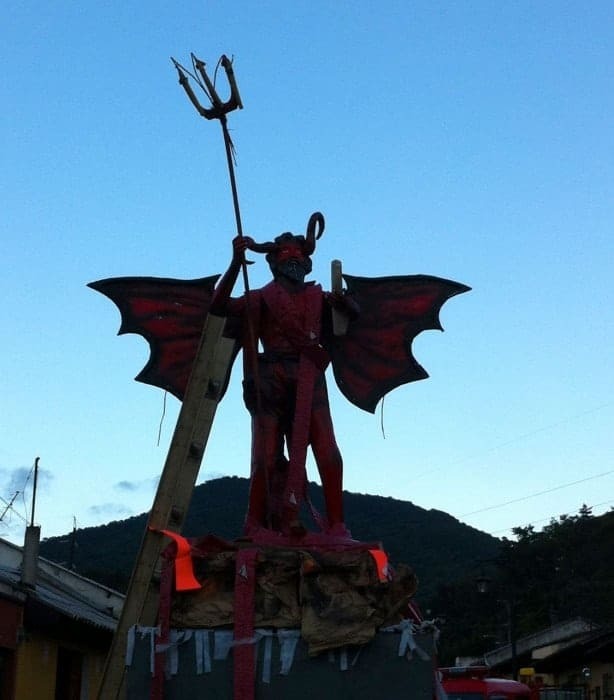 A papier-mâché effigy of the devil serves as a hub for a giant communal bonfire and a firetruck with firefighters were on standby. Much like most other Guatemala celebrations, food is a highlight of the festiviaties. We arrived before 6 pm, first browsing the food stands offering bunuelos (deep friend donuts drenched in anise-scented honey), rompope (eggnog) and tortas (crusty buns stuffed with meat and crisp vegetables) and then chose a vantage spot to watch the festivities. 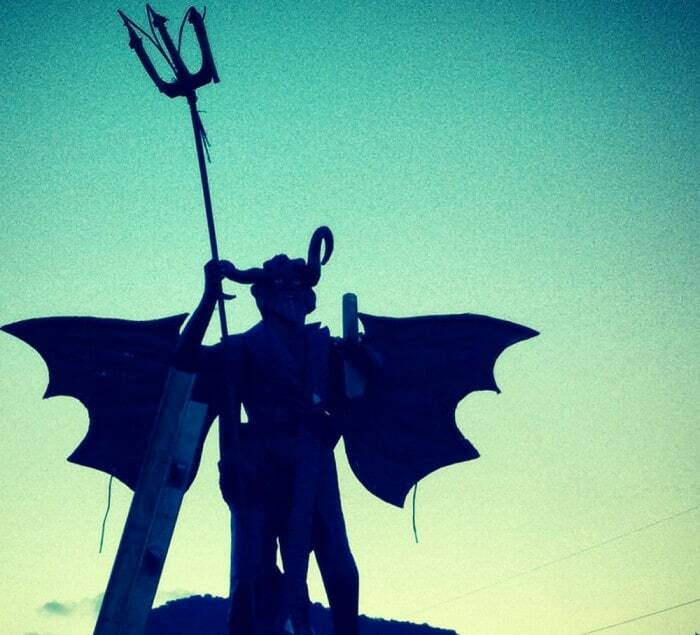 Rubbing shoulders with locals, we watched as the 10-foot tall devil, crafted by artist Pablo Godinez Pichiya, got soaked with an incendiary fuel. The air filled with the smell of gasoline. Then, a costumed announcer stepped forward and, to the sound of a full brass band, renounced a long list of transgressions committed by politicians, before a torch set the effigy of the devil on fire. Sparks danced into the night sky, cameras snapped and shouts of enthusiasm rose from the crowd. It was a bacchanalian celebration merging Guy Fawkes Day and Halloween. The Burning of the Devil or Quema del Diablo is an incredible way to usher in the Christmas season! In my opinion, it sure beat shopping at the local mall. Tours of Guatemala: Culture Xplorers partners with local communities to offer a range of cultural tours as well as custom tours through Guatemala. 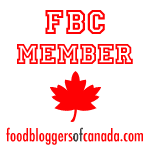 Read more in my review of their tours in Luxury Latin America. 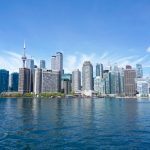 Getting Around: I’ve always had a good experience with Adrenalina Tours. Read more about transportation to Guatemala in Night Bus to Guatemala. What a great dose of culture to absorb in one day. Looks like a very interesting time to visit – and with the crowds in your photo I can see why they would want to keep the festivities in check. Never heard of El Dia del Diablo. I love old celebrations. They burn Zozobra in Santa Fe each year- draws a lot of people- but it’s not an old tradition- dates to the 1920. People love fire- it’s so elemental. I’d not heard of Dia del Diablo before and found the information in your post fascinating. I like the idea of banishing bad spirits to usher in Christmas. I also find it interesting that fire features in so many celebrations. I’d rather burn anything than go to a mall:-! It sure beat shopping at the local mall. Couldn’t agree more! I so love your posts that detail the richness of the Guatemalan culture. I hope one day you’ll turn these into a book. I’ll be on a river cruise in Germany, not at a mall in America! This looks very entertaining – it isn’t every day you see a virgin festooned in lottery tickets. (I live in Florida – don’t think there are many virgins in general!). The gasoline dousing sounds very dangerous but I think it’d be fascinating to see. As a short person I would want to watch from a balcony! So cool! Kind of like Burning Man South. Loved the hotel pics, too…. Fascinating post, Michele. From the gasoline-doused devil to the swank lobby and pool of the hotel, Guatemala is certainly a land of contrasts and diverse experiences. Culture Xplorers sounds like a good way to get in on the local action. Yes I would want to live in the Hotel Cirilo too. In fact I’m plugging that away for retirement dream 😉 Guatemalan culture is fascinating as seen through your eyes and blog posts. I love everything about this post. Thanks for sharing! I’ve never heard of the Dia de Diablo celebration before, and enjoyed learning about it. Thanks for sharing! And I’d love to stay in that hotel! Wow, the celebratiions on the Dia del Diablo seem so exciting!! Some folks in our fair city would benefit from having their sins forgiven by the burning of an effigy of the Devil. And, yes, I would gladly spend a few peaceful days at the Hotel Cirilo (especially if I’d had my sins burnt up with el Diablo! Such an interesting article. I am always amazed at all the different customs and celebrations around the world!! Great photos too!! 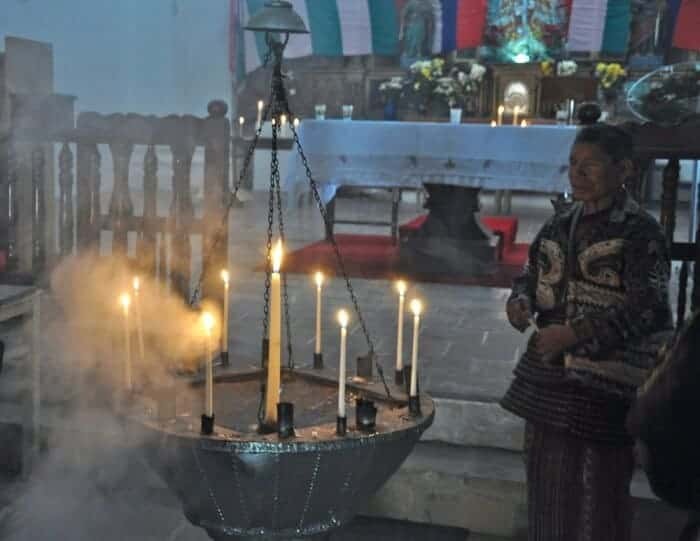 This practice became Guatemalan tradition since colonial times, because the December 8 Catholic Church celebrates the day of “Aur Lady o Concepción”, whose image goes is carried in procession through the streets of the capital city. ( And other cities of Guatemala, as Zacapa and Villa Nueva), which have as their patron. Some days before that date, residents cut the bush in front of their houses and clean the streets. The accumulated waste is burned on December 7 at 6:00 PM. At some point someone thought to burn garbage also was burning the devil. Currently, those who advocate a clean and healthy environment, we strive to convince those who insist on this absurd practice not to burn pollutants such as plastics and tires. But as always, ignorance of a few affects us all . On 9 July 1990 a “devil” got away to Canada. And this devil will have much affection in Guatemala, and suffering snow, ice and cold will be serving 57 years on 22 December. Unless you come to Guatemala, where he expects a “cochito” and the warmth of San Vicente, Cabañas, Zacapa. I’ve long wanted to go to Bocas del Toro so it’s really interesting that they also wear Dia del Diablo masks there. Ha! You’re so right. I’d prefer this ceremony to shopping in a mall any day. What a great post. Thanks Michele!